A treasure trove of practical knowledge for effectively hacking Lisp in the 21st century. This is your chance to learn from the master! A piece of jewel. Overall, an amazing book and one that must be on your desk if you are a serious Lisp developer. If Lisp is more than a hobby to you, Common Lisp Recipes will soon become one of your personal classics. If you want to become a Lisp expert, this book is for you. I have been programming in Common Lisp for the last 35 years, but when I went through the new book, I felt like a kid in a candy store, discovering all kinds of new/old patterns that were enlightening to me. Great work, Edi! Jans Aasman, president and CEO of Franz Inc. The optimization chapter is excellent. I'm not aware of any other resource that summarizes all this information and the explanations are clear. This is a great reference. Weitz writes with clarity and concision, and has produced a book which can be read in one sitting or dipped into at leisure and will extend the practice of even seasoned Common Lisp professionals. A book every Common Lisper should keep within arm's reach. 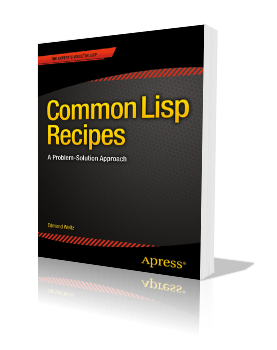 This is the web page for my book Common Lisp Recipes (ISBN 978-1-4842-1177-9). Previews are, for example, available via Amazon or Google Books. The book is also available via Springer Link, so if you are a student, you might be able to read it for free from within you university's network. Errata and Addenda can be found here. If you find any errors in the book which aren't already listed there, please email me. The code from the book is here. Note that this is not code that's meant to be actually used. Some of it is even defective or inefficient on purpose. These are just fragments intended to save you some typing if you want to follow the book's text. In case you like the book (or if you just want to do me a favor), recommend it to your friends. Or write an Amazon review. Or blog about it. Or tweet about it. Or link to this page. That'd be nice! If you're completely new to Common Lisp, you might also want to check out Peter Seibel's Practical Common Lisp.